Well, hello there. I have a lot to share with you so I am going to get right to it. Today’s post is somewhat of a short novel. I apologize. 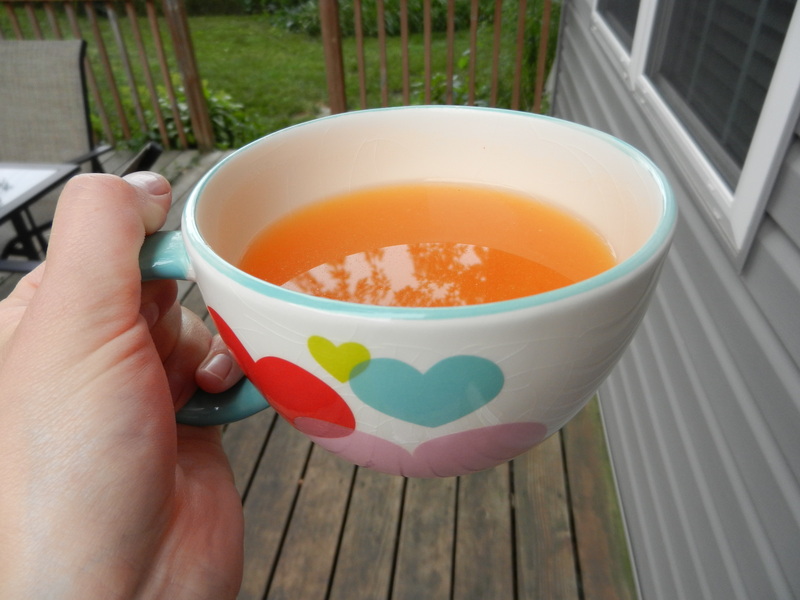 For those of you who follow my blog regularly, you know that I am combatting some health issues. Anyone just reading for the first time, I was diagnosed with Ulcerative Colitis at the age of 12 and since then have lived with flare-up, remission, flare-up, remission, etc. etc. I was healthy for over two years without any bouts until about 2 months ago when I started having symptoms again. Now, as a Registered Dietitian my first thought was to try to help the healing process through diet. The diet is something you can control. I began a low-residue, low-fiber diet to try and give my intestines a little time to rest. Think chicken, potatoes with out skin, apples without skin, Cream of Wheat, bananas, etc. Along with the low-fiber diet, I also consulted my gastroenterologist who started me on medications right away. As time progressed, my symptoms only got worse. I went back to the doc who then switched my meds again. At this point, I was so frustrated with the low-fiber diet and not being able to eat the foods I love (especially raw veggies) that I kind of let loose on the whole diet thing. For breakfast and lunch I would eat low-fiber but then at dinner I was oftentimes making myself a small salad just to fulfill my cravings. Nothing was working, and I was tired of it. Long story shorter, I was ready to try something different. Dana bought this book for me, and ironically my mom has the same one from when I was younger. My mom tried EVERYTHING with me when I was sick as a child, but so many of these diets are incredibly hard to follow because you do have to be strict. As a teen, you weren’t going to stop me from going out with my friends and having pizza or other fun snacks. I would eat the pizza and then feel completely miserable afterwards. I wasn’t able to make smart decisions because I didn’t want to risk missing out on social moments. I will never be able to thank my mom enough for all of the time, research, money, love, and support she gave me and still does. Now that I am older though, I have a better understanding of my priorities. 🙂 Also, I know that I can still be social and have fun, I just need to be careful what goes into this delicate body of mine. I pulled this information right from their site which you can link to by clicking on the title below. “The Specific Carbohydrate Diet™ has helped many thousands of people with various forms of bowel disease and other ailments vastly improve their quality of life. In many cases, people consider themselves cured. It is a diet intended mainly for Crohn’s disease, ulcerative colitis, celiac disease, diverticulitis, cystic fibrosis and chronic diarrhea. However it is a very healthy, balanced and safe diet that has health benefits for everyone. The foods that are allowed on the SCD are based on the chemical structure of these foods. Carbohydrates are classified by their molecular structure. The allowed carbohydrates are monosaccharides and have a single molecule structure that allow them to be easily absorbed by the intestinal wall. Complex carbohydrates which are disaccharides and polysaccharides are not allowed. They are not easily digested and feed harmful bacteria in our intestines causing them to overgrow. This produces by products and inflames the intestinal wall. The diet works by starving out these bacteria and restoring the balance of bacteria in our gut. The SCD is biologically correct because it is species appropriate. The allowed foods are mainly those that early man ate before agriculture began. The diet we evolved to eat over millions of years was predominately one of meat, fish, eggs, vegetables, nuts, and low-sugar fruits. I have forever had issues digesting complex carbohydrates. I always joke about how I love bagels but bagels don’t love me. Sometimes I can eat them and feel fine, but oftentimes I eat them and regret it a few hours later when my stomach begins to bloat like a balloon. In my teen years, mom brought me to a holistic doctor. I remember him waving a bunch of scents under my nose while testing my body’s resistance at the same time—pressing on my arm and asking me to push against it, etc. I remember I was slightly intolerant to lactose and gluten. To this day I am still the same way. I am a true believer in holistic health and healing. I also know, that western medicine is a necessity in a lot of cases. As a dietitian, this diet does make sense to me and it does sound completely legitimate. 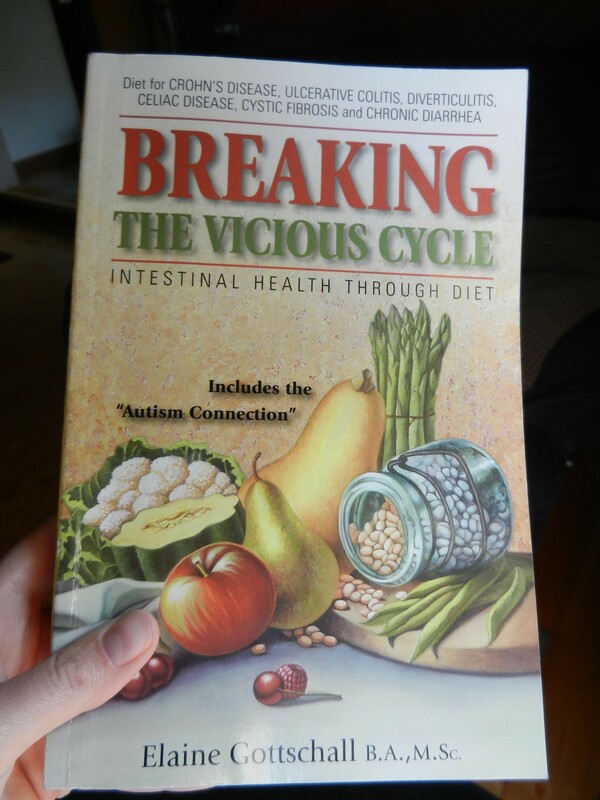 The book explains the science behind our bodies digestion process and goes on to explain that our bodies have a difficult time digesting these complex carbohydrates and we are not able to get rid of all of the sugars involved. These sugars therefore sit in our intestine and begin to ferment, which can cause a lot of gas and can cause inflammation as well. As a gal with ulcerative colitis, the last thing I need is EXTRA uncomfortable symptoms. After reading this book and talking it over with the hubs and madre, I have decided I am going to give it a whirl. 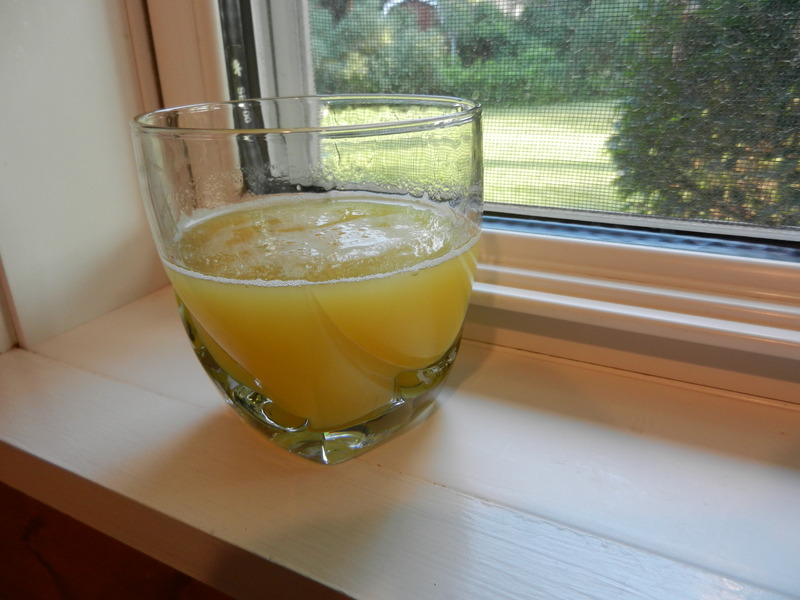 Pressed apple cider or grape juice mixed 1/2 and 1/2 with water. See, SCD™ Legal / Illegal List for more information about allowable juices. I started this intro diet yesterday and bless Dana’s heart, he is doing it with me. Because my symptoms are no longer severe, we will only be doing the introductory diet for two days before moving into the next stage (which looks and sounds WAY better). To prepare for these two days we made a big batch of hard-boiled eggs, lean beef patties, 100% grape juice gelatin, homemade yogurt, “legal” cheesecake made from homemade yogurt and dry curd cheese, and allowed chicken soup from scratch. We also stocked up on Dole 100% pineapple juice. The prep is pretty tedious but if this diet works like it says, then it’s worth it. 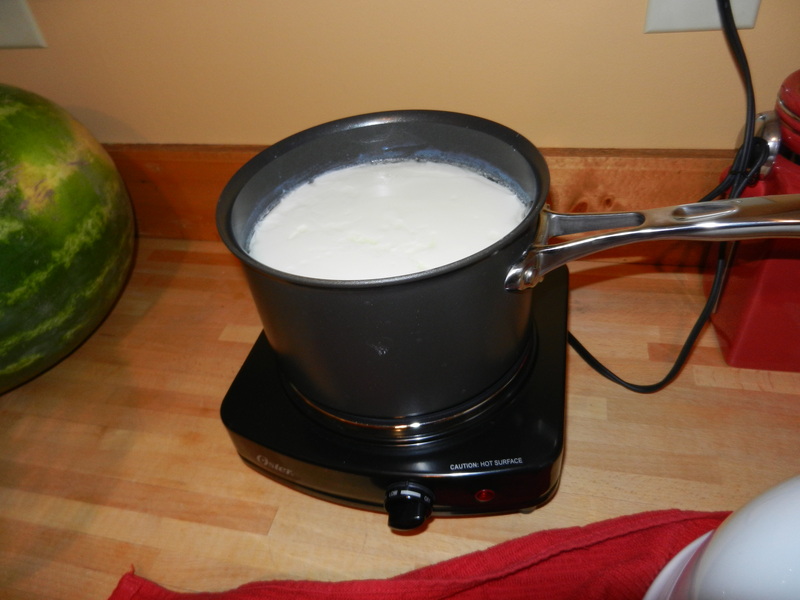 This was my first time ever making homemade yogurt. Getting the temperatures just right was the hardest part, but I think we got it down now, and next time we make it will be a lot easier. Homemade Yogurt: following the directions to a T is very important as you are making sure to rid the product of all lactose remains. 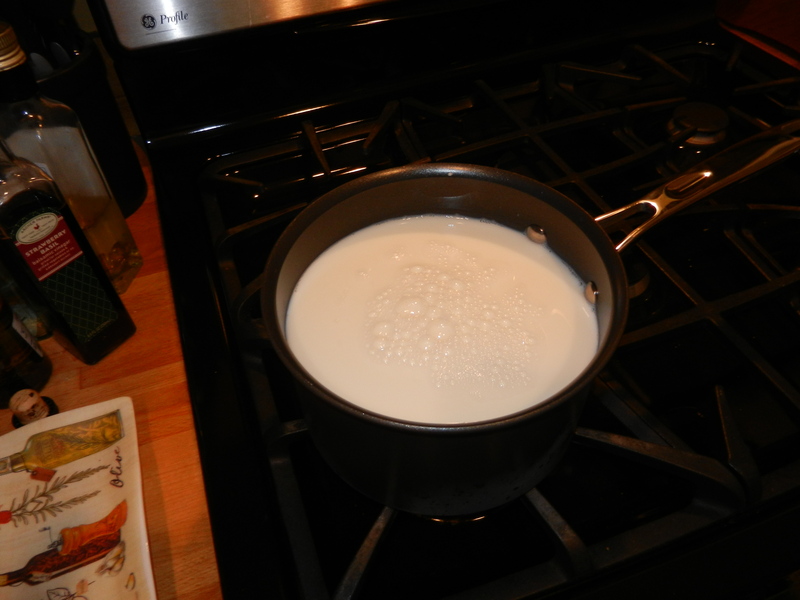 Bring 1/2 gallon of 1% milk to simmer; stirring often. Remove from heat. 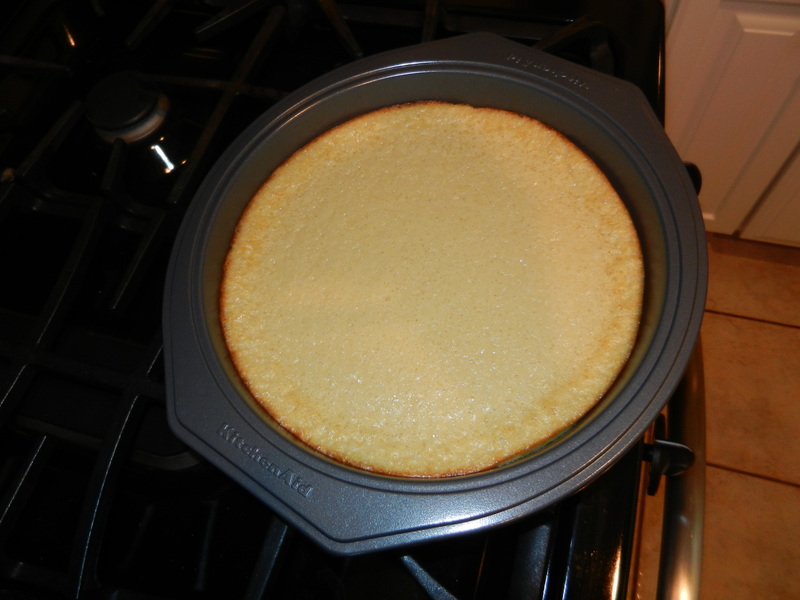 Cover and cool until milk has reached room temperature (64-77°F). 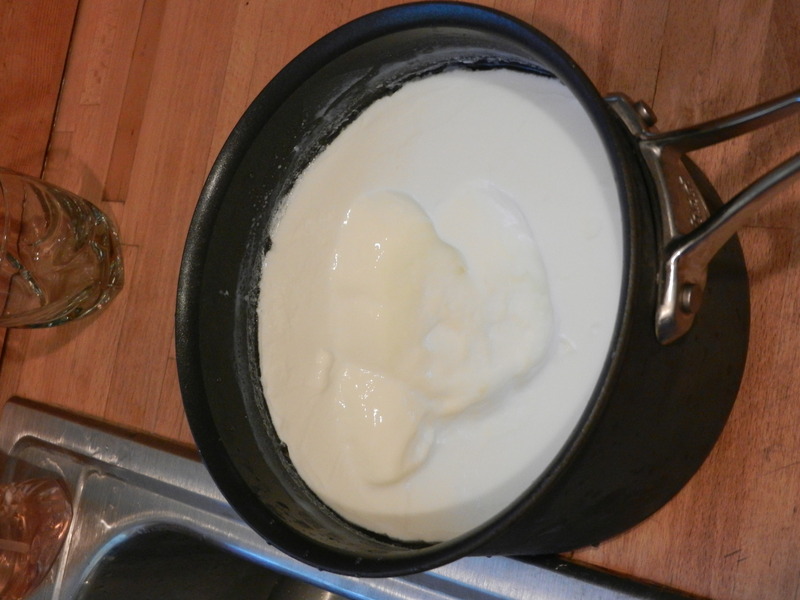 Remove 1 cup cooled milk and make a paste with 1/2 cup good quality commercial yogurt*. 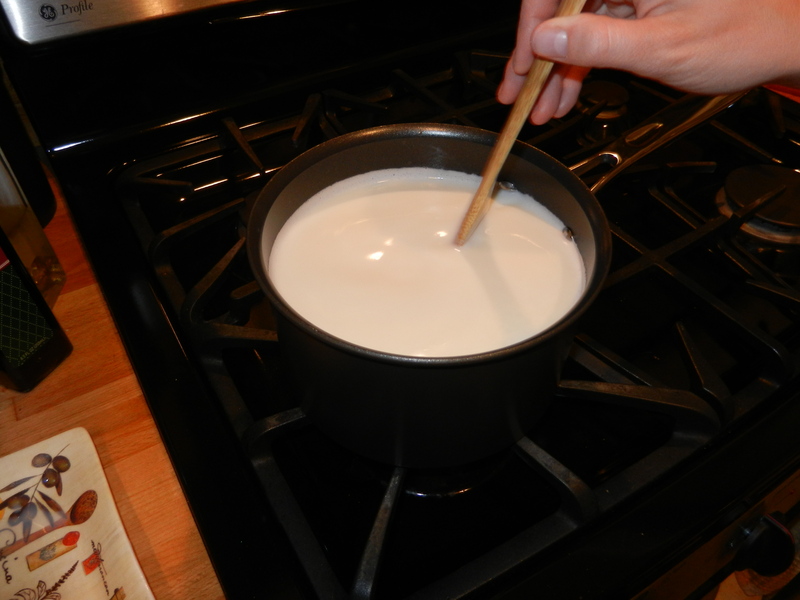 Mix the paste with the remainder of the cooled milk and stir thoroughly. 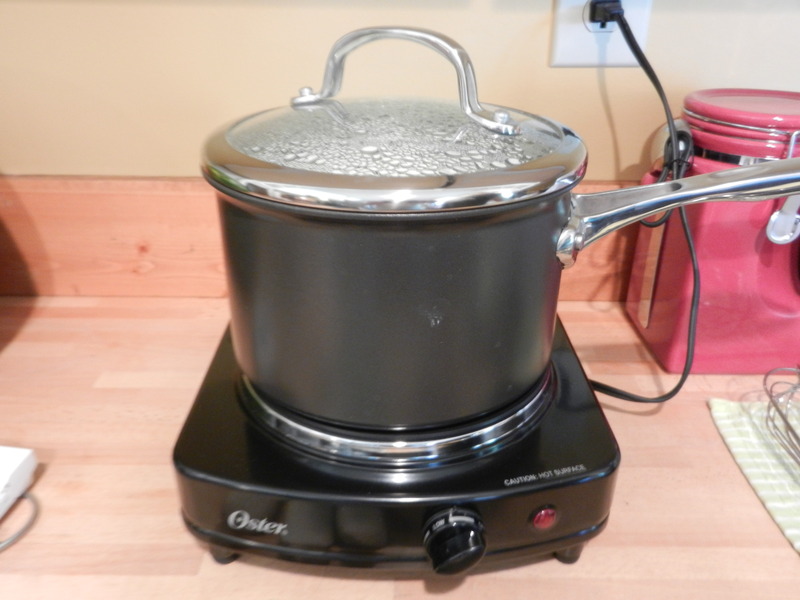 Cover pot and place on a hot plate heated to 100-110°F; let stand on hot plate for at least 24 hours. Remove from heat and place in fridge to cool. *The yogurt should be unflavored and unsweetened. Buy one containing only milk or milk solids and bacterial culture. Recommended cultures are Lactobacillus bulgaricus, L. acidophilus, and S. thermophilus. I will not lie to you, I am hating these first two days. No fruits or veggies besides those from fruit juice? I am not a meat or fish lover, and I can only take eggs in small amounts. The Farmer’s Cheese, aka Dry Curd Cheese gives me the worst after taste in my mouth. Blech. The chicken carrot soup is OK, but very bland. I tried making the cheesecake this morning hoping that would be something that I would enjoy but no, because of the cheesy aftertaste I’m not a fan. 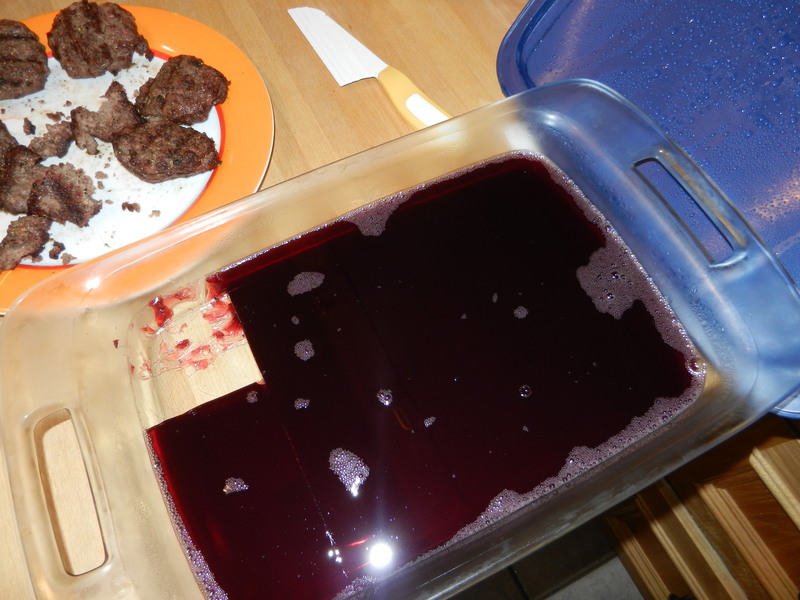 I am loving the 100% grape juice gelatin however, so I have been eating an insane amount of that. 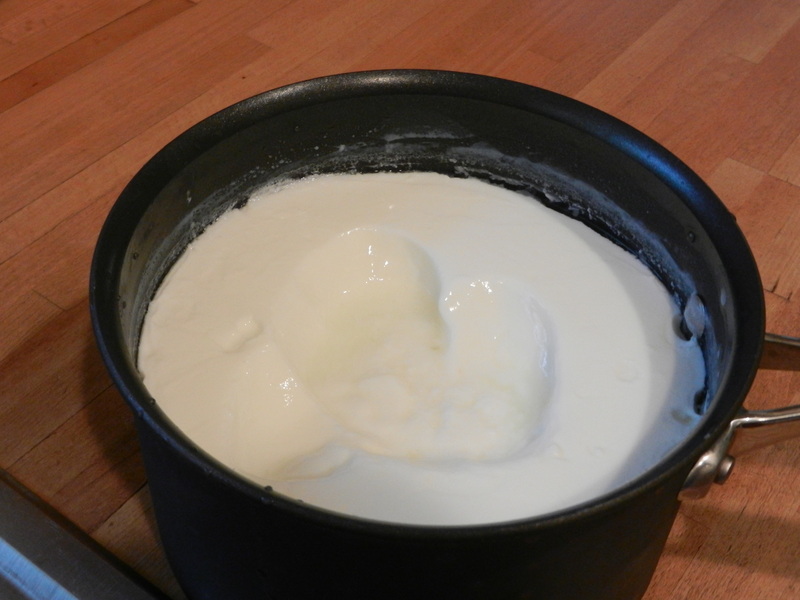 The homemade yogurt I believe needs to wait until tomorrow before I can really incorporate more of it. It felt good to complain for that brief moment. I am trying to remain positive. Tomorrow, we move on to the next phase which is slowly introducing fruits, veggies, nuts, and proteins. Considering I am not a huge complex carb eater in general, the next phase will be very similar to my pre-flare diet with tons of fruits and veggies and beans too!! My symptoms are already improving drastically and it’s only been a couple of days. On Friday I ate low-carb all day, the only thing I ate that “wasn’t allowed” on the SCD was corn. Then yesterday of course I followed to the very strict intro diet, along with today. I have had zero bloating. You read that right. ZERO. I am utterly amazed at the progress already. I am continuing to take my medications as prescribed by my doctor as well as implementing this diet. Also, the book emphasizes the importance of supplementing with vitamins during this time. If you are thinking about starting this diet, please consult with your physician first. They will make sure this diet is okay for you and help you determine what supplements you may need to take. I am so excited to be sharing this journey with you all. Besides from these first two days, this will not be a major lifestyle change for me. Sure, there will be some changes: a lot of food preparation to ensure that there are no complex carbs, a lot of dishes, making smart choices when out with friends, etc. I will do my best to adapt to these modifications. The book recommends you stay on this diet for a year to increase your chances of curing the disease completely. They don’t recommend that you “give it a try” for a month and then quit even if your conditions improve. But, I am only human and although I will continue a very low-carb diet in the future, this is a diet that I will not stay on forever. As I progress through the stages of this diet, I will continue to keep you posted and update you on the changes. There will be some seriously awesome veggie-packed recipes coming your way soon, that anyone will enjoy, even if you’re not following the SCD. And that is the nutshell version of what is going on in our household. I am off to get a few things done around here. Catch up with you later! 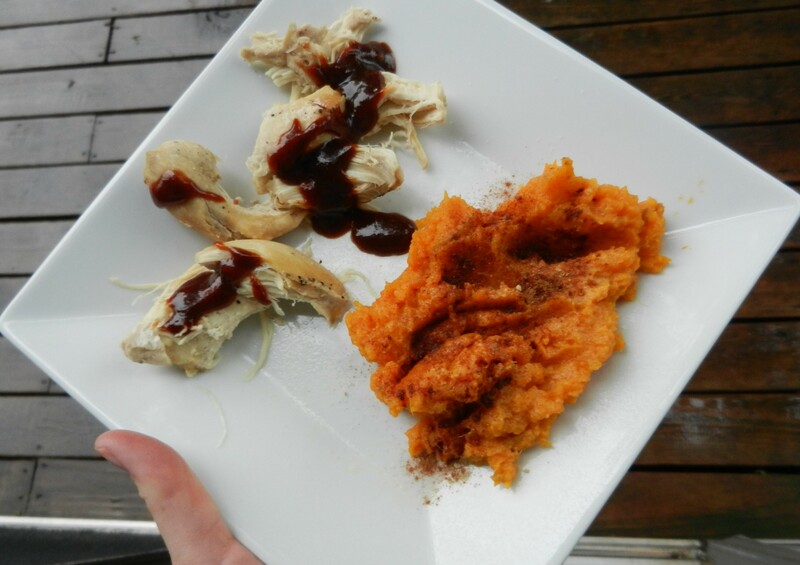 This entry was posted in Health, Home Life and tagged Food Trials, healthy living, Life, SCD, U.C. by Melanie. Bookmark the permalink. Thank you so so much for your advice. You are such an inspiration! I am going to check out that website because I am a little confused about the whole transitioning through the stages of introducing new foods bit. I know I am going to have a hard time not jumping right ahead and introducing the raw fruits and veggies, but I will try and be careful and do my best. Thank you again for your advice and thank you for reading!